MainAll NewsInside IsraelYa'alon to Arutz Sheva: I'm a fig leaf? Ya'alon to Arutz Sheva: I'm a fig leaf? Former Defense Minister: We have moved the Israeli-Palestinian issue aside. I'm not a fig leaf. 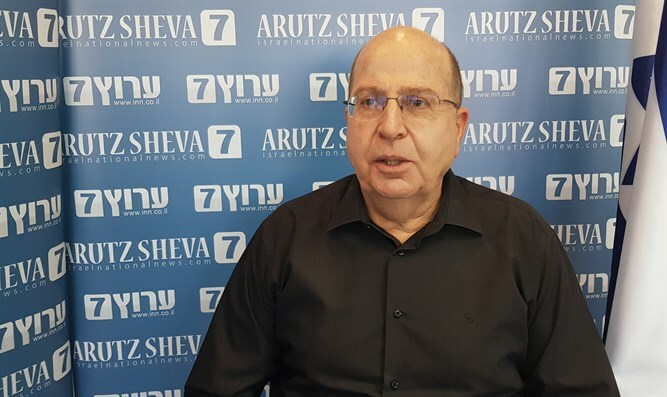 Former Defense Minister Moshe Ya’alon, one of the leaders of the Blue and White party, discussed, in a comprehensive interview with Arutz Sheva, his first since joining Yair Lapid and Benny Gantz, his new political home as well as his political positions. What is the line that you are leading, which you define as ‘statesmanlike right’? "When I decided to resign [as Defense Minister] in 2016, I announced that I was going to run for the national leadership, and it was clear to me that I was going with my political-security positions, but I am also concerned about statehood," Ya'alon added. "What happened after the 2015 elections brought me to the present place. Both on how to relate to what is supposed to be a Jewish democratic state with all that this entails, and certainly about leadership from which I expect purity, and that was my big crisis with Netanyahu, speaking of Case 3000 that is returning to the headlines. This is what I call being right in the political, security perception but also statesmanlike. If you want - this is Menachem Begin - and it could also be Yitzchak Rabin." So what did you create in Blue and White? You are sitting in the same party with people who talked about evacuating communities. How will it work? "Over the past two years, I met quite a few party leaders. I told them that I had entered politics because of the Israeli-Palestinian issue and because I had unique insights on the subject. I was privileged to serve as Minister for Strategic Affairs and as Deputy Prime Minister, cabinet member, member of the Knesset and then Minister of Defense. What worried me when I resigned was not the Israeli-Palestinian issue, but where the State of Israel is headed from within. Do we want a united society or not? Our unity is critical. After all, when did we have a destruction in our history? In situations like today, where there was mutual incitement, and that's dangerous." But how will it work in the field? If they want to evacuate communities, how will you act? "It is for this purpose that we sat and talked even before we joined together and then we delayed an announcement for two weeks in order to agree on a common platform. We are saying in essence that we will continue to argue over left and right on the Palestinian issue. Is that the main thing? After all, what happens inside us becomes an existential threat. You can see in the platform how we move aside the Israeli-Palestinian issue with formulations that reflect a broad agreement and we focus on what is important - on bringing the back on track, on a leadership that unites, cares for the state and the citizen first and foremost, and not for other things. Leadership of personal example and integrity. With that, we intend to lead the country." Maybe you're just looking, as they say about you, to bring about a situation of ‘anyone but Bibi’? "It's not personal, but in essence it's true. Is there an argument between the Likud, Blue and White, the Jewish Home or the Labor Party that there is a need for honest leadership? One that takes care of all the issues out of the view that Israel comes first?" There is a feeling in religious Zionism that this is not the party that will take care of this public. Will you succeed in working within this framework for religious Zionism? "I have been active and remain active today, with great appreciation for religious Zionism that has become a pioneer in many ways. Religious Zionism has replaced the kibbutzim that were in this place at the time of the establishment of the state. I view the pre-military preparatory programs as a nucleus for the advancement of the state. There are certain places that pull religious Zionism to places that are not good. The fact that Bibi placed Kahanists in the Jewish Home crossed a red line as far as I’m concerned. I know there is harsh criticism in religious Zionism about these moves. The issue here is not right or left but where the State of Israel goes. This is not the current way in politics." What does Kahanists mean? After all, Itamar Ben-Gvir is an activist and, if necessary, changes are also made there. Is this an illegitimate party as far as you’re concerned? "If a picture of Baruch Goldstein hangs in his home, is that a Jewish act? If the ideology is death to the Arabs - at all costs - is that appropriate? It should be said that he who sets to kill you, kill him first. Is doing what Goldstein did the model? Absolutely not. This is dangerous, Netanyahu is consolidating his rule by bringing Kahanists into the parties, the coalition and the government. Netanyahu brought the Likud down to this place." If you look at the polls, in order to create a majority, you will need the Arab parties. "That’s a spin. I embrace the Arabs who do not threaten me. That is the Likud’s perception according to Jabotinsky. Integrating them into Israeli society. I visited the homes of three Muslim families who lost their sons in the war against Hamas in Gaza." "I would outlaw Balad. The others are not Zionist and we do not talk to them. They will not be in our coalition. The fact that the Arabs are technically part of such a bloc, as far as I’m concerned, let them recommend Bibi. We do not talk to them about recommending us and we do not negotiate with them to enter the coalition. 'Bibi or Tibi' – that’s a spin." Will you invite the Jewish Home to the coalition, if you head it? "We said that the first party we will call is the Likud without Netanyahu. If he does not form a government, he will go home. We estimate that this is what will happen. We will not force the Likud to enter. We will turn to Labor and to every Zionist party - including those on the right. I do say that I have reservations about the Kahanists." Would you like to be appointed Defense Minister in the next government? "In the agreement between us, we determined the roles. First of all, Benny Gantz is our candidate for Prime Minister, Yair Lapid is Foreign Minister and I am Defense Minister." What will you do that has not been done so far on the Gaza border or on the northern border? "I will not utter slogans. I heard Bibi before 2009 criticizing Olmert for his policy and saying he would topple Hamas. When I was Defense Minister Liberman said similar things, and now Bennett is speaking like that. I am very critical of the situation in Gaza. After Protective Edge, for three and a half years Hamas did not dare shoot one bullet, and it is not because it became a Zionist group. When you end such a confrontation and Hamas does not receive any of its demands from us, but rather is counting its losses, that's significant." "Last year they started to get close to the fence and cross it, after years when they were forbidden to approach the fence. In addition, cabinet ministers' statements about the terror balloons, that you do not go to war over such a thing, are a mistake. This is a derogatory statement. I said that those who underestimate the burning of the fields will receive rockets on the Gaza envelope and on the Dan region. And here it happened to us," noted Ya'alon. Let's talk about the Azariya effect. Do IDF soldiers fear the legalization? "If there is a fear now in someone, the commanders have to deal with it. I do not believe that there is such a fear. That does not mean that everyone is operating in an orderly manner. I look at it from the side and see too many cases that end in a situation where we have casualties and the terrorists are able to flee the scene. As Defense Minister or when I was a commander, I would look into the situation and take care of it. There are other steps in which I am experienced. How did we deal with the knife intifada? We put good soldiers in the right places, demolished homes, deterred the family members. It worked. We also dealt with incitement." Would you have done anything differently [in the Elor Azariya incident]? Viewers who come from the right say to themselves - he is a fig leaf meant to attract the right.